The expansion of industries and the increase in domestic demand have been moving ahead in Africa thanks to its wealth of natural resources. In recent years, the region has attracted international attention due to its stable economic development. Direct investments in Africa from overseas have also been increasing, giving a boost to economic growth. Toshio Matsubara and Osamu Sawaji of the Japan Journal profile some of the African and Japanese individuals who have been contributing to Africa's economy through business. Nahfkenn Associates President Kennedy Fintan Nnaji alongside a drum filled with recycled copper. Nahfkenn Associates is located in an industrial park in Yashio, Saitama Prefecture, which is adjacent to Tokyo. Dismantled vehicles, engines, and scrap electric wire are piled up in the company's recycling factory. Employees including Nigerians, Ghanaians, and Japanese are silently dismantling engines and sorting electric wire. A huge machine installed in a corner of the factory makes copper from scrap electric wire. The particles look like sand as they pour smoothly into a drum. "About three drum cans are filled with copper every day," says Kennedy Fintan Nnaji, the president of Nahfkenn Associates. "The copper that is recycled here is used for industrial purposes." Nnaji came to Japan from Nigeria in 1992. His brothers and cousins lived in the United States at the time, but Nnaji was interested in living in a non-English-speaking country. The country he chose was Japan, an economic giant in Asia. After he arrived in Japan, he attended a Japanese language school and worked part-time for a toy manufacturing company, where he acquired skills in operating various machine tools. He also learned Japanese calligraphy to help him remember the Japanese characters and attended a computer school, acquiring knowledge eagerly. He founded Nahfkenn Associates in 2000 and established an office in Tokyo. Initially, the company was involved in interpreting and translation. He was involved in interpreting and translation related to import and export, which led him to launch an export business. His company's main business was purchasing used automobile parts and used home electronics and exporting them to countries in Africa and other regions. The export business went well. After the Automobile Recycling Act came into force in Japan in 2005, resulting in stricter regulations to encourage the recycling of automobiles, Nnaji established a recycling factory in Yashio and launched a vehicle dismantling business. "I thought that the introduction of new rules would lead to the generation of new businesses related to the rules," says Nnaji. "I was also handling automotive parts, so I viewed it as an opportunity to expand our business." He also began producing and selling copper by purchasing a machine for separating copper from scrap electric wire, including a huge amount of wire harnesses (electric wire for vehicles) generated in the dismantling of vehicles. He founded another company in Nigeria, employing local people. The company not only sells used automotive parts exported from Japan, such as engines and suspensions, to customers in Nigeria, but also exports these parts to neighboring countries. "I believe that the recycling business is indispensable in every country. Without the recycling business, countries become polluted. Japan is clean because vehicles, cans, food, and a variety of other goods are recycled here," says Nnaji. "In Nigeria, a lot of recyclable goods are disposed of. I want to contribute to Nigeria one day by using Japan's recycling technologies." In 2010, Nnaji established an incorporated non-profit organization called Imo State Union Japan together with people from Imo State of Nigeria living in Japan. 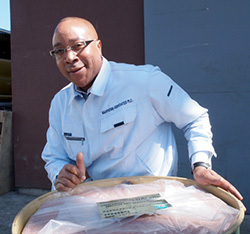 The organization provides livelihood support to Nigerians living in Japan and undertakes activities for introducing Nigerian culture and traditions to Japanese people. In addition, Nnaji frequently receives requests to give interviews to the press and hold lectures as a Nigerian entrepreneur. "I have never been discriminated against in Japan because I am a foreigner. I have been very lucky because I have met a lot of nice people. I want to say 'thank you' to the Japanese people," says Nnaji. "There are a lot of outstanding people in Nigeria. I hope that more students from Nigeria will come and study in Japan, and that they will work successfully as the next-generation leaders one day." 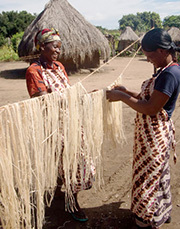 Women in Mfuwe village hang banana fibers, which will be made into high-quality banana paper. Bananas are a global food. They are grown in around 125 countries, and their annual production amounts to around 100 million tons. However, it is not widely known that paper is made from bananas in some banana-producing countries. The fiber taken from banana canes is the raw material of high-quality paper. One Planet Café, a stock company based in Tokyo, strives to protect Africa's environment and create employment in the region with this banana paper. The banana paper produced and sold by One Planet Café is made from bananas grown without pesticides in Zambia, a landlocked country located in southern Africa. One Planet Café is managed by Satoko Ekberg (Japanese) and her husband Peo Ekberg (Swedish), and Billy Nkhoma (Zambian). The Ekbergs have been involved in consulting, writing, lecturing, and other activities related to the environment for many years in Japan. They were motivated to start producing banana paper when they visited Zambia to implement a plan to construct elementary schools in Africa. "As we visited schools and talked with the teachers and parents, we became aware of the reality that even if schools are constructed, children will not attend them if their parents do not fully understand the importance of education or have jobs," says Satoko Ekberg. "So we decided to start by creating a place where adults learn the importance of education and acquire skills for getting jobs." In 2007, the Ekbergs established an educational institute for adults, One Planet Café Zambia, in Mfuwe village, together with people from the village. The village is located close to the South Luangwa National Park, which is one of the most biodiverse national parks in Africa. They initially held computer classes at the institute, because computer skills would increase people's chances of being employed by companies as clerical workers, for example. They also came up with the idea of producing banana paper as a method of creating employment while protecting the environment. 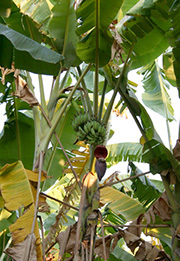 In Zambia, bananas are grown as a common food, and there were many banana farms around Mfuwe village as well. "The problems faced by the village, including poverty, a lack of education, forest destruction, and poaching of wild animals, are all connected. It is because they don't have jobs that they cannot send their children to school, and they become involved in poaching. Or they cut down trees because they cannot afford to buy fuel," says Peo Ekberg. "We thought that if they obtained an income by producing banana paper, they would no longer need to cut down trees or engage in poaching." Banana canes, which are the raw material of banana paper, are cut down after the bananas are harvested in order to grow new bunches of bananas. They would ordinarily simply be disposed of after being cut down. They are sustainable resources because they regrow within just one year after being cut down. In 2011, a project with the aim of producing banana paper made in Zambia was launched with the cooperation of a printing firm in Hokkaido, which made business cards using banana paper from Bangladesh. Peo Ekberg learned how to produce banana paper and studied how to produce it in Zambia. After trial and error, he succeeded in rubbing water off the canes by using treated wooden boards and producing the fiber by sun dying fibers. He taught this skill to women in Mfuwe village, and the task of producing the fiber became their job. The fiber thus produced is processed in Japan with "Washi (Japanese traditional paper) knowledge" and made into a high-quality banana paper called One Planet Paper®. Currently, eight Japanese companies have developed and sell products made of One Planet Paper®, including business cards, origami paper, notebooks, and wallpaper. The business of producing banana paper was soon in full swing, and seventeen women and men are now involved in its production. A fair salary enables them to solve basic poverty challenges, and their children now can attend school. Some of the company's sales proceeds are used to give classes in English and mathematics to adults who have not had the chance to attend school. "Based on the case example of Zambia as the model, our goal is to establish One Planet Cafés in ten locations around the world in the coming ten years," says Satoko Ekberg. "They may deal in fair trade products or function as a type of school. We would like to contribute to the sustainable development of Africa and the world through a variety of fair businesses." Toshio Matsubara is a freelance writer. In Kenya, horticulture is a major export industry, being the third largest foreign currency earning industry following tourism and tea. Above all, fresh flower exports are growing rapidly. Kenya is located at a high altitude and its climate features significant temperature differences between night and day, along with long daylight hours, making it highly suited to growing roses. The roses grown in the abundant sunshine are very colorful, have thick stems, and live for a long time. 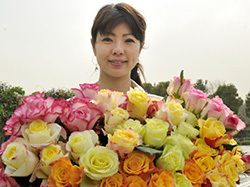 Megumi Hagiuda, the representative of the company Africa-flower, was attracted to the beauty of Kenyan roses. She imports roses from Kenya to Japan and sells them mainly online. As a student of international relations at an American college, Hagiuda participated in the Model United Nations held in New York, where she learned how serious the problem of poverty in Africa was. "I had a strong desire to visit Africa one day to see the situation with my own eyes, talk with the people in person, and think about what I could do," says Hagiuda. After graduating, Hagiuda returned to Japan and worked for a global pharmaceutical company for six years. In 2011, she went to Kenya as a member of an NGO that supports the construction of primary schools. While there, she undertook activities in rural areas on weekdays and returned to Nairobi on weekends. One day, some roses that were being sold on a street happened to catch her eye. Hagiuda loves flowers and is licensed as a master of kado, the Japanese art of flower arrangement. However, she had never seen such roses before. "The gradations of red, yellow, and white were beautiful and there was a wide range of varieties. I was surprised, and doubted whether they were really roses at all. They remained beautifully in bloom in my room two weeks after I had bought them, although I wasn't able to take sufficient care of them," says Hagiuda. "When I was about to return to Japan after spending six months in Kenya, I began to wonder whether I could sell those beautiful roses in Japan." Hagiuda decided to launch a business importing flowers from Kenya. Due in part to the limited number of exporters and the problem of the minimum number of lots, the current quantity of roses exported from Kenya to Japan is less than 1% of all the roses exported from Kenya. However, Hagiuda thought that the creation of a large market in Japan would help promote employment and resolve the problem of poverty in Kenya. Hagiuda was introduced to a rose farm by her acquaintance. Hagiuda concluded a contract for direct imports with the rose farm that employed a Kenyan and did not use child labor. The farm understood her enthusiasm and accepted orders for small lots of flowers of several hundred each. Hagiuda launched the online store "Africa-flower" in October 2012. Currently, the company imports 500 to 1,000 flowers from Kenya every month and sells them in Japan. Her customers love the flowers' bright colors and durability. "We are still at the stage of collecting market data. I hope we can expand the sales channel gradually and contribute to increasing employment in Kenya as much as possible. We are planning to expand the sales channel to hotels, wedding centers, and other locations while focusing on Internet retailing," says Hagiuda. "Flowers enrich people's minds. I want to spread the beautiful roses of Kenya all over Japan and all over the world." In Africa, people and goods cannot move around easily because infrastructure and transportation systems are not fully developed. This lack of mobility is a drag on the region's economy. For example, a truck loaded with supplies may have to wait for several days or even weeks before it is permitted to cross a border. To improve this situation, the Japan International Cooperation Agency (JICA) assists in the establishment of One Stop Border Posts (OSBPs) at borders in Africa. Currently, at many borders in Africa, procedures such as immigration examinations and customs clearance are conducted on both sides of the border when supplies are transported from one country to another. The system of OSBPs enables the officials of two countries sharing a border to complete the examinations and procedures, which used to be conducted twice, jointly (simultaneously). JICA supports the introduction of OSBPs mainly in three fields. First, it supports the conclusion of agreements between countries for securing the positions of customs officials and setting the authorities of the ministries concerned, including the police, and the establishment of domestic laws. Second, it supports the development of infrastructure by helping with the construction of border posts and donating information equipment and vehicles for border surveillance, for example. Finally, JICA also dispatches customs officials from Japan to the region to foster local human resources such as customs officials and cleaning agents. In 2007, JICA began supporting the introduction of an OSBP at Chirundu, where there is a border between Zambia and Zimbabwe in southern Africa. It began operating in 2009 as the first OSBP in Africa. It is said that the time taken to cross this border has been reduced significantly thanks to the OSBP. In addition to the one at Chirundu, JICA is now supporting the introduction of OSBPs at thirteen borders, mainly in East Africa, including one at Rusumo, between Rwanda and Tanzania, and one at Namanga, between Kenya and Tanzania.